I have a new accessory: a giant boot. I’m supposed to be wearing it, but as we were baking cookies (with lots of flour) I took a break and the kids tried out the boot. Hopefully my son will never need one! Nothing like a stress fracture to slow an active person down. Actually, I wasn’t letting the fracture slow me down, at least not enough, so it’s a good thing I’m lugging this boot around now. Its impossible to walk really fast in this boot. Slow I go, and now my bone will heal. Meanwhile the boot throws my hips out of alignment and “hello” to back pain. Add a lift to balance the hips. Immediate pain on the bottom of my non-injured foot. Try a lift with arch support. Removed that within five minutes, no sense in creating a new injury. 1) sit and not move for three to six weeks. 2) stretch as much as possible. 3) keep doing other exercises to balance my hips and stabilize my torso. Solution number one, although ideal in many ways, is completely unrealistic. Solution two is something I can do for a few minutes morning and night, and occasionally in between. Solution three is essential even if the dishes haven’t been washed or the kids are not in bed yet. Of course, 3 to six weeks of non impact cardio, that is a problem. Bike would be the best thing, but I have children and when can I get down to the gym? It’s so much easier to just do 50 jumping jacks then toss a load of laundry in the wash, do another 50, wash some dishes, do some push-ups, more jumping jacks, referee the kids, more jacks, and then find a few minutes at the end of the day to do a few more. Combined with walking kids to various places that makes for good activity, but 30 minutes straight, in a gym on a bike? Impossible, or at least highly unlikely! Hop on one foot? I’ll have to give that a try. 1) The kids will get better at doing things for themselves. 2) I have a dance background and strengthening feet is something I can do! This fracture will not reoccur; my feet will become as strong as they used to be when I danced. Today I taught a creative movement class for preschoolers, 2 1/2 years to 4 1/2 years. I do this on most Mondays. The class used to be a Toss Your Toddler dance class which was a lot of fun and both parents and toddlers participated. (I still teach this class but it has now been moved to Wednesday mornings at 10:30 am). In this class there is a lot of running, jumping, falling, rolling and partnering with your toddler. Mateo and I loved this class; loved the partnering parts, the rolling together, climbing on top of me. I miss not having him participating in the class when I teach it on Wednesdays, but he’s getting too old, he’s growing up, the other kids are so young. He’s a preschooler now, not a toddler. But we have the Creative Movement class now…. It’s not the same. It’s me and a whole bunch of wonderful other kids and Mateo, who I have to treat as just another student. Which I can’t do of course, especially when he says, “Mama, I want to eat.” Luckily that was just two minutes before class ended. But today was difficult, sad really, even though it was a great class and I had a blast teaching. Mateo wanted to partner with me; he wanted to ride on my belly when we did the crab crawl, he wanted to come up and waltz with me for the waltz music, he wanted to roll with me instead of by himself, and a couple other times. It was sad to have to tell him that we couldn’t do those things together. He understands that I’m the teacher and that there aren’t any other moms in the class, but soon he will really understand and stop asking me to partner with him in the class. Will we make enough time or the effort to do those things at home? By ourselves? Without the dance class? As my belly gets bigger and bigger? Ah, but we did slither on our bellies this week. I kept my weight mostly on my arms and knees to keep the pressure off the belly, but it worked. For how many more weeks? Today, after spending the morning cleaning, I carried the scooter for 2 hours around Fort Greene Park. At one point I was carrying my son and the scooter, since he refused to walk up a hill; I guess the hill would look very large from the height of 33 inches. Part of the time I chased my son while he chased a ball. The ball would roll down the hill as he intended it too, but then a kind citizen would stop and catch the ball and hand it to Mateo, he would then do it again, because he really wanted the ball to roll far and all those people kept on thwarting his plans. His father, Guillermo, was playing tennis. Then 5:45 arrived and with it my time to rest, while Mateo and Guillermo played tennis together. Mateo was really too tired, but he wanted to play with Papa. I think Mateo’s tennis skills are amazing, unbelievably amazing for a two year old. Of course I am his mother and, as such, I am biased, but his hand eye-coordination really is quite good. He spends so much of his time being active with me, I really enjoy having the opportunity to step back and watch his father and him play together, tennis or anything really. I like being able to sit back and enjoy the way they have such a great time playing together. I remember when Mateo was much smaller, Guillermo world turn on the music, loud, and dance and jump around the apartment while holding a younger Mateo: supporting his bottom with one hand and holding his hand with the other. Around and around they would go. Laughing and smiling until Guillermo was too tired to do any more, but Mateo would insist and they would dance some more. I was usually busy cleaning or doing dishes while they did this, but I would always watch and enjoy their enjoyment. They did it again this weekend, Mateo didn’t want to, he was busy playing with his marble maze, but once they began, they kept on going and having a great time, marble maze forgotten. Before I had started teaching the Sling Your Baby dance class, it was actually Guillermo and Mateo who did most of the dancing around the apartment. I was just too tired to move mostly, so in many ways the idea for the class came from watching them together and seeing how much of a workout it can be to dance and move while carrying a 15 pound baby, and it’s so much more fun than traditional exercise; your exercise partner is right there with you from his (or her) birth. Does playing trains count as exercise? 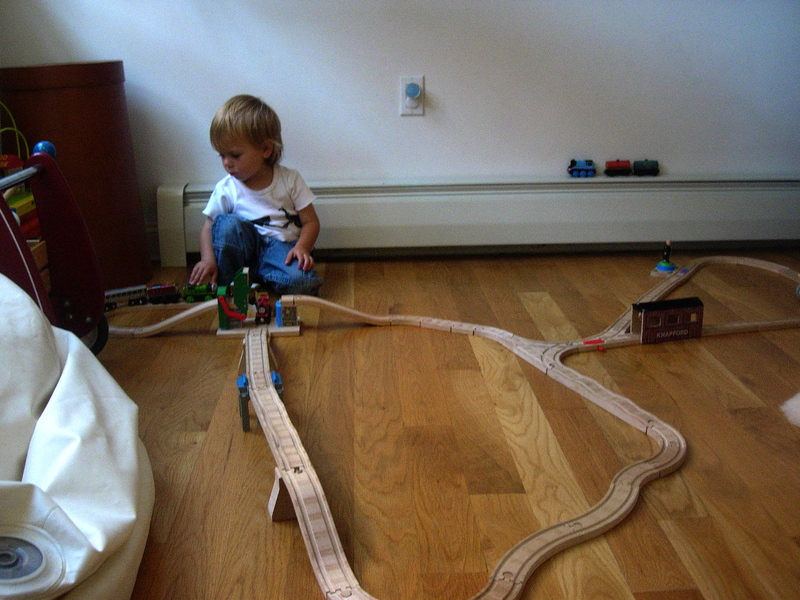 So, my son woke up from his nap and we sat for a bit as he likes to do as he wakes up, then he wanted to play train. So we started to play train about 15 minutes into playing train on the floor I realized my arms were tired! Was it from playing train or from pushing the swing in the park? Probably both. 25 minutes of crawling, crab crawling, lifting my body up and over train tracks, supporting my full body weight on one arm and a knee and general maneuvaring of my body in and out of a train track, I was exhausted. Mateo’s is getting great exercise too! I collapsed on the floor to rest and put my feet up the wall and suggested that we read a book. What better way to rest is there than to sit and read? Mateo stepped over me and choose a book from the bookshelf: Barnyard Dance by Sandra Boynton. So much for my plan to rest. Instead we pranced like a horse, scrambled with the little chicks, leaped like a frog, and promenaded by two!